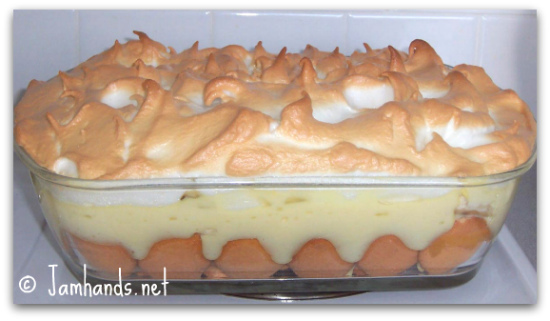 I'm willing to bet that most people haven't seen a banana pudding with meringue baked on top. This recipe comes from Maya Angelou and uses a from scratch vanilla pudding, sliced bananas on top of a layer of nilla wafers. The pudding got quite brown only after 15 minutes, much more brown than I would have liked. I think next time I would bake only till tips were golden. Regardless, it tasted great. Day two taste test: As much as I loved this pudding, it’s definitely not as good on day 2. The nilla wafers turn to a grainy sorta paste. I would think this recipe would be great just minus the wafers if you planned on having leftovers the next day. If you are planning on only serving it once, go for the wafers. 1. Preheat oven to 350f. In a large saucepan, combine 1/3 cup sugar, cornstarch, and salt; stir until blended. Mix in milk. Cook over medium heat, stirring constantly until thickened and boiling; boil 1 minute; then remove from heat. 2. In a small bowl, whisk egg yolks, then whisk in about 1/2 cup of hot custard until blended. Pour yolk mixture back into saucepan of custard; cook over medium heat, stirring, 2 minutes. Stir in butter and vanilla until blended. 3. Place vanilla wafers on bottom of a shallow 2-quart casserole dish. Top with layers of banana slices and custard. Repeat layering, ending with custard. 4. In a large mixing bowl, beat egg whites and 1/4 cup sugar at low speed until frothy. Add cream of tartar; increase speed to medium and gradually beat in remaining sugar. Beat until egg whites hold stiff peaks. 5. Spoon meringue over hot custard immediately, making sure that meringue touches baking dish on all sides (this prevents it from shrinking). Transfer to oven and bake until golden, about 20 minutes. Remove pudding from oven and cool 1 hour. Refrigerate at least 4 hours before serving. This looks wonderful! My hubby loves bananas so I know this would be a hit. Thank you for visiting my blog today! I enjoyed my tour of yous. Oh, MY! This looks incredible. Banana has really been a favorite around here lately. Out of the blue. That looks fabulous and I happen to love bananas!! Thanks for stopping by Pink Dandy Chatter ...following you! This is the way my mother made banana pudding. I am 65 so this is a very old , tried and true recipe. This is the only way my mom and aunties made banana pudding. If per chance you don't have bananas, use crushed (DRAINED) pineapple. Works wonderfully!! I was gonna say the same as Janet above. But I can go to the third generation of my family. A lot of them used meringue on banana pudding and some pies.. I adored Maya Angelou as an actress and poet.